SEVEN weeks ago Moussa Mara was the rising star of Malian politics. Picked by Ibrahim Boubacar Keita, the country’s president, to be prime minister at the age of 39, he had a reputation as a shrewd and capable administrator. An eventual rise to the top seemed possible. When he defied warnings on May 17th and visited Kidal, a hotbed of ethnic Tuareg separatism in the far north-east of the country, he was met by rebel gunfire. This made him a hero to the crowds in the capital, Bamako, for standing up to secessionists seeking to destroy the country’s unity (see map). 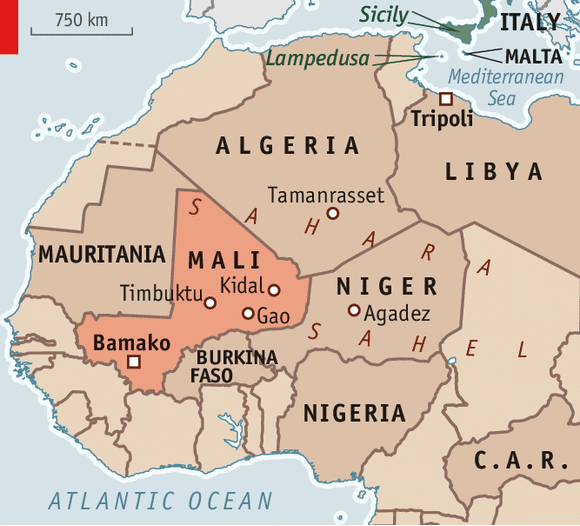 Yet what began as a triumph quickly turned into Mali’s worst crisis since a coup two years ago. Fuelled by what diplomats describe as a combination of naivety and ambition, Mr Mara condemned the Tuareg violence as “a declaration of war” and promised an “appropriate response”. Around 1,500 troops, equipped with artillery, steamed north. Despite assurances from the government that dialogue was the only way forward, on May 21st they were ordered to attack the rebels. Within hours the army was in retreat. After trading heavy machinegun and rocket fire, rebels seized the government camp in Kidal, as well as a former French fort that has a commanding position above the fly-blown town. Separatist flags fluttered in the desert wind. At least 50 soldiers were killed in the encounter, 50 were taken prisoner, and 900 surrendered their weapons and sought refuge at a nearby UN post. Mr Mara’s reputation lies in tatters and opposition members of parliament have demanded his resignation. Malians struggle to understand how, for the second time in two years, their rulers have lost control of the north. “They led our children to slaughter,” Fatoumata Traoré, the mother of a soldier, wailed in the pages of Dépêches du Mali, a newspaper. Others are asking why Mr Keita is said to have spent $40m on a private jet when the army has virtually no aircraft at its disposal. Nine months ago he was elected president with 78% of the vote, and the rebels seemed to have been defeated. How did things go so badly wrong? The short answer is that they were never really fixed. Despite winning a strong mandate to haul the country forward, Mr Keita has succumbed to the habits of past rulers. A high-living 69-year-old who tends to stand on his dignity, he has done little to tackle the political rot that precipitated the coup in 2012. His government is aloof and unaccountable. Unemployment, high prices, corruption and nepotism are as rife as ever. Islamic extremists, kidnappers, separatists and smugglers once again roam the sandy north with apparent ease. The official response to what happened in Kidal is instructive. Both Mr Keita and Mr Mara denied ordering the attack. Diplomats in Bamako do not believe them. Mr Keita “is either lying or he’s not in control of the army and government, and both are pretty damning indictments of his presidency,” says one. Ordinary Malians in the street are equally disbelieving. The defence minister, Soumeylou Boybeye Maiga, resigned six days after the attack, but not before the government tried to deflect criticism onto foreigners for letting Mali down. Mr Mara had to remind his fellow citizens that France and the UN “are not our enemies”, while also appearing at a government-orchestrated protest against supposed foreign responsibility for the government’s humiliation. At one rally the UN’s headquarters in Bamako was pelted with stones. UN and other Western officials shake their heads. “Mali was given such a good opportunity,” says one. In any case, criticism of France, in particular, is growing. Many Malians say that the French government is so wary of getting sucked into a quagmire that it has left the job half-done. Its troops have fought terrorists in the north, but the French government has left the UN to broker a political settlement: no easy task. By refusing to back Mali’s government flat-out against the Tuareg rebels in Kidal, France has avoided triggering a full-scale insurgency. But Mr Keita, who swept to power on a nationalist platform, has seen little reason to heed UN pleas to make deals with any of the armed groups vying for control of the north, who range from separatists and outfits wanting autonomy to outright jihadists. He has consistently undermined peace talks with the rebels, stacked a truth-and-reconciliation commission with government stooges, and tried to sideline the UN. “Any change in Mali, like anywhere else, has to come from the national side,” says a diplomat in Bamako. UN officials hope the humiliation in Kidal will make the government, hitherto so full of nationalistic swagger, readier to compromise. 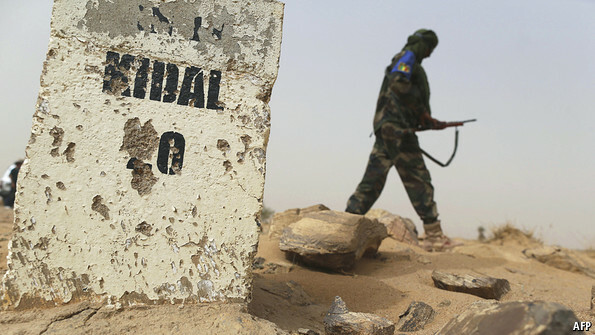 For France and its forces in Mali, the timing of the débâcle in Kidal could hardly have been worse. The defence minister, Jean-Yves Le Drian, had hoped to announce the end of “Operation Serval”, France’s mission in Mali, on May 25th. Some troops would have remained under the auspices of a regional counter-terrorism force, but the government in Paris could still have declared “mission accomplished”. Instead Mr Le Drian was forced to cancel his celebratory trip to Bamako. Meanwhile French troops persuaded the rebels to abandon a march on Timbuktu, the biggest city in the north, and forced them to relinquish a string of other towns they had captured in the north-east. But the political and military campaign to restore stability to Mali—and the wider Sahelian region—is plainly far from over.